Posted on January 14, 2014 by Barbara H.
As many of you know, we care for my mother-in-law in our home, and one problem area in caring for someone who is almost immobile and now somewhat contracted is dressing them. First we used hospital-type gowns: you can Google “hospital gowns” and find several places online to buy them. But the aide who cares for her during the week prefers using knit shirts because the hospital gowns’ length and extra fabric would get in the way while changing or positioning her or would get bunched up around under her. At first I didn’t like having her just in a shirt and Depends, but then she is in bed most of the time and covered up: even when we have her in her wheelchair for a couple of hours a day, she’s covered with a throw blanket, and we have enough to keep her warm. We use the longer hospital gowns if we take her out to the doctor or something, but just a shirt for everyday at home in bed. As my mother-in-law got more contracted, it became harder to get a knit shirt on her arms and over her head. She keeps one arm pretty close to her body and it takes many encouragements to relax it before we can move it even to put deodorant on or put a sleeve over it, so we went back to hospital gowns. I did cut off the length of one and hemmed it up so it wouldn’t get so bunchy. They are much easier to get off and on, but they’re all short-sleeved (the only ones I found online with long sleeves opened in the front, which wouldn’t work for my m-i-l), and with cooler weather we wanted something with long sleeves. 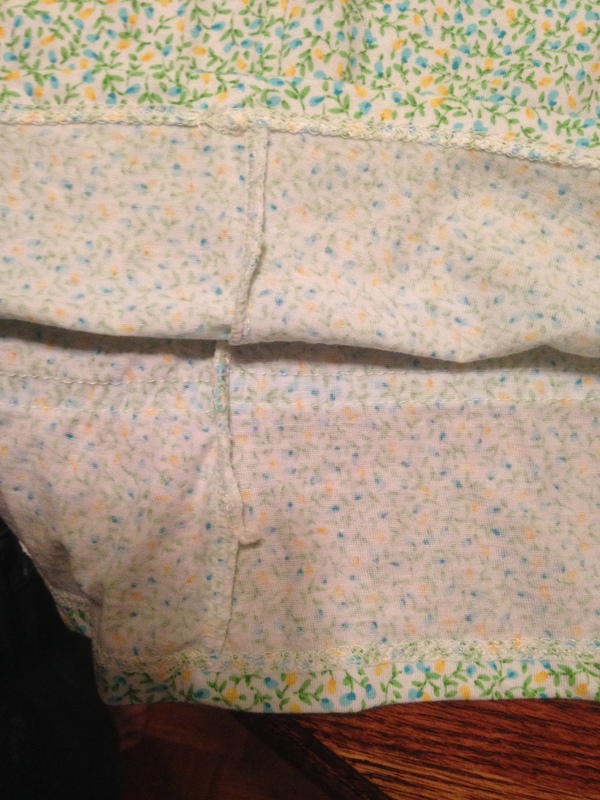 I was just about to look up patterns and see about making our own gowns when it occurred to me that I could take an existing gown and turn it into a hospital gown by cutting the back open and placing a Velcro patch at the top. I was concerned that the fabric taken up by finishing the edges and overlapping to use Velcro might make the gown too tight through the shoulders, so the first one was an experiment. Thankfully, most gowns are roomy enough that that wasn’t a problem (I had also thought of doing this with one of her knit shirts, but I think that would make a shirt too small). Then I turned under the raw edges just enough to stitch them down (with the knit fabric it pretty much curls into place, but I’d say I turned it under about 1/8 or 1/4 of an inch and then under again. The smaller you can make this, the less you’ll lose of the gown. Then I sewed a Velcro patch on the right side of the fabric on one side of the gown, and the wrong side of the fabric on the other side (sounds more complicated to explain than it actually is, but basically you want to be able to place one side over the other). Important note here: do not use stick-on Velcro! 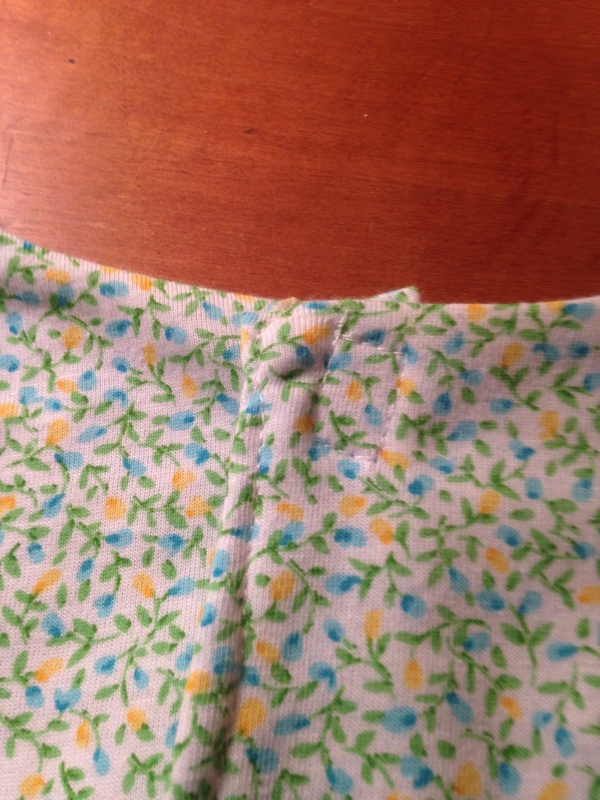 The adhesive doesn’t stick well enough on fabric to stay on through opening and closing the gown. I knew that and thought I’d use it anyway to hold the Velcro in place while I sewed it, but the adhesive glopped up my sewing machine needle with goo. 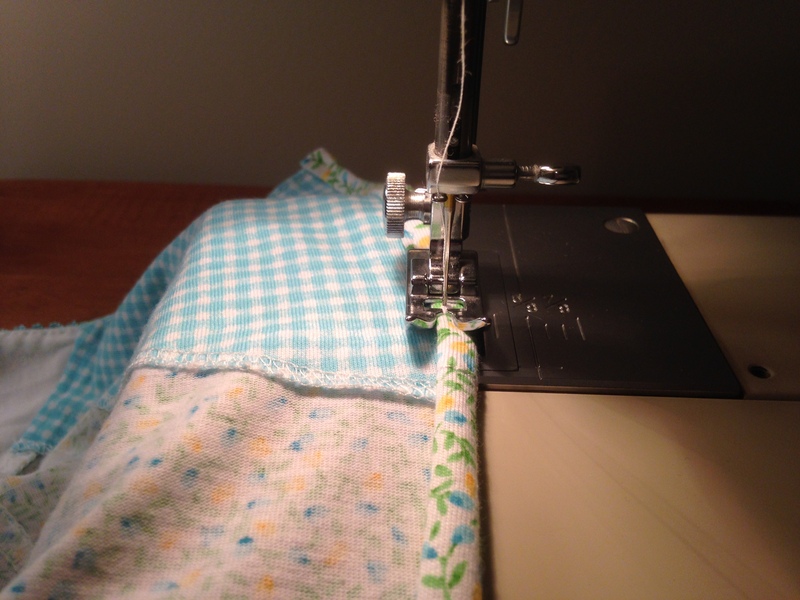 Using the sew-on kind is not hard at all. My mother-in-law’s caregiver and I were really pleased with the results. Not only is it easier to get on her and warmer, but the fabric is softer and more pliable that a regular hospital gown. For now I’ve left it its original length, but if it gets as bunchy and in-the-way as the other hospital gowns, I can cut the length off – probably not as short as a shirt, but shorter than gown-length. 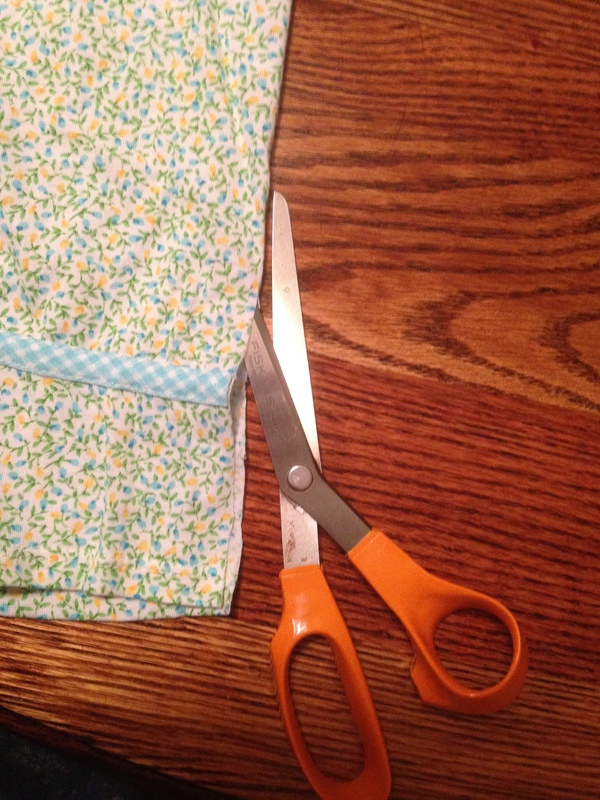 If you have a serger or some way of finishing the edges without turning them under, and you want to make ties for the top instead of using Velcro, you could do this without losing the inch or so in the back. The Velcro, to me, is easier to use than tying ties. I wouldn’t use a hook and eye closure if the person using the gown is fairly immobile, because you have to watch their skin constantly for any breakage or chafing (which could quickly develop into a bedsore), and I’d be afraid a hook and eye would be more prone to that. There you have it! I’ve redone a couple of her gowns now, and since it worked so well, I’ll be doing a few more in the coming days. I’m linking up with “Works For Me Wednesday,” where you can find an abundance of helpful hints each week at We Are THAT family on Wednesdays. This entry was posted in Works For Me Wednesday and tagged hospital gown by Barbara H.. Bookmark the permalink. I’d think they are prettier too. That’s important!! I love when these kinds of ideas work out so well!! Very very clever, Barbara. And what an act of love!!! Blessings to Grandma! I like the idea, Barbara! Great idea esp if any of her gowns had sentimental value. I found a way to make a garmet for my MIL and thought it might work for you as well. Check it out and see if it will work. 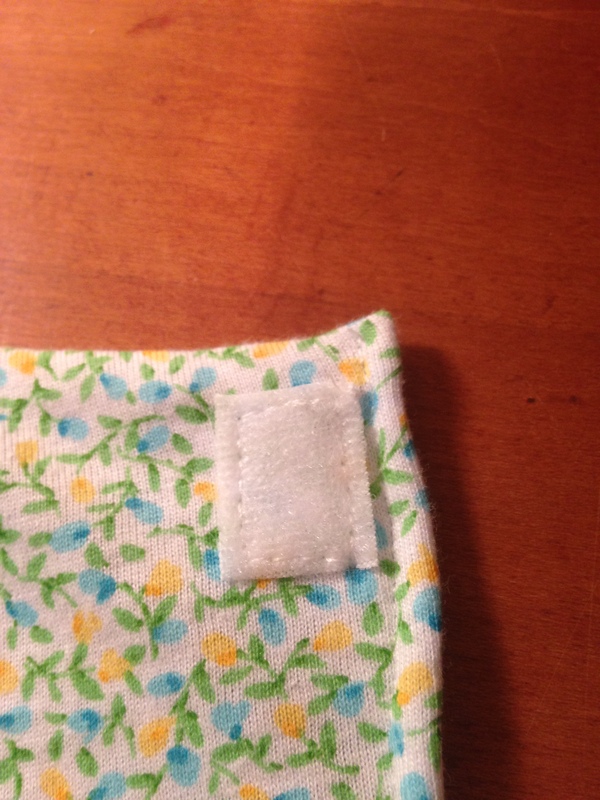 Use small snaps instead of Velcro which can be irrating to the neck. Thanks so much for this. I have sewed for years but have not had to dress my MIL. I live away from her and my dear daughter has taken care of her for years. She is now bed ridden and she had some long lounge wear. I was going to just cut it shorter, but now I will cut it up the back and add the Velcro so it is easier for her to put it on her grandmother. GREAT IDEA!